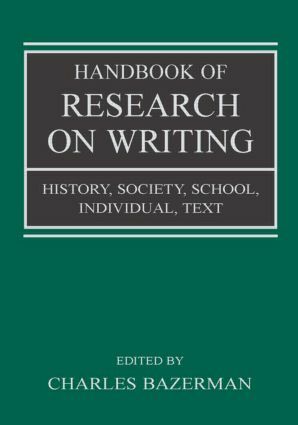 The Handbook of Research on Writing ventures to sum up inquiry over the last few decades on what we know about writing and the many ways we know it: How do people write? How do they learn to write and develop as writers? Under what conditions and for what purposes do people write? What resources and technologies do we use to write? How did our current forms and practices of writing emerge within social history? What impacts has writing had on society and the individual? What does it mean to be and to learn to be an active participant in contemporary systems of meaning? This volume, in summing up what is known about writing, deepens our experience and appreciation of writing—in ways that will make teachers better at teaching writing and all of its readers better as individual writers. It will be interesting and useful to scholars and researchers of writing, to anyone who teaches writing in any context at any level, and to all those who are just curious about writing. Introduction. Part 1: History of Writing D. Schmandt-Besserat, M. Erard, Origin and Forms of Writing. B. Gabrial, History of Writing Technologies. D. Jury, History of Typography. D. Finkelstein, History of the Book, Authorship, Book Design, and Publishing. P. Prior, K. Lunsford, History of Reflection, Theory, and Research on Writing. Part 2: Writing in Society. G. Smart, Writing and the Social Formation of Economy. D.E. Smith, C.F. Schryer, On Documentary Society. P. Tiersma, Writing, Text, and the Law. C. Bazerman, P. Rogers, Writing and Secular Knowledge Apart From Modern European Institutions. C. Bazerman, P. Rogers, Writing and Secular Knowledge Within Modern European Institutions. J. Anderson, The Collection and Organization of Written Knowledge. P.C. Hogan, Writing as Art and Entertainment. M. Conboy, Writing and Journalism: Politics, Social Movements, and the Public Sphere. A. Beaufort, Writing in the Professions. U. Howard, History of Writing in the Community. M.P. Sheridan-Rabideau, Writing, Gender, and Culture: An Interdisciplinary Perspective. B. Faber, Writing and Social Change. Part 3: Writing in Schooling D. Olson, History of Schools and Writing. P. Boscolo, Writing in Primary School. G. Hillocks, Writing in Secondary Schools. R.H. Haswell, Teaching of Writing in Higher Education. D. Roen, M. Goggin, J. Clary-Lemon, Teaching of Writing and Writing Teachers Through the Ages. S. Murphy, K.B. Yancey, Construct and Consequence: Validity in Writing Assessment. J. Albertini, Teaching of Writing and Diversity: Access, Identity, and Achievement. Part 4: Writing and the Individual D.W. Rowe, Development of Writing Abilities in Childhood. J. Cheville, M. Finders, Defining Adolescent and Adult Writing Development: A Contest of Empirical and Federal Will. N. Nelson, The Reading-Writing Nexus in Composition Research. D. McCutchen, P. Teske, C. Bankston, Writing and Cognition: Implications of the Cognitive Architecture for Learning to Write and Writing to Learn. J. Hengst, C.J. Johnson, Writing and Communication Disorders Across the Lifespan. J. Singer, G.HS. Singer, Writing as Physical and Emotional Healing: Findings From Clinical Research. A.F. Ball, P. Ellis, Identity and the Writing of Culturally and Linguistically Diverse Students. D. Atkinson, U. Connor, Multilingual Writing Development. Part 5: Writing as Text D. Biber, C. Vasquez, Writing and Speaking. M. Schleppegrel, Grammar, the Sentence, and Traditions of Linguistic Analysis. C.M. Tardy, J.M. Swales, Form, Text Organization, Genre, Coherence, and Cohesion. C. Miller, D. Charney, Persuasion, Audience, and Argument. A. Wysocki, Seeing the Screen: Research Into Visual and Digital Writing Practices. Charles Bazerman is Professor and Chair of Education at the University of California at Santa Barbara. In 2007 he was elected to second vice president of the College Composition and Communication association, the higher education division of the National Council for Teachers of English, the largest English & Composition association in the United States, and he will be president of the organization in 2010. He has authored, coauthored, and coedited numerous titles, and also edits a series of Reference Guides to Rhetoric and Composition for Parlor Press.